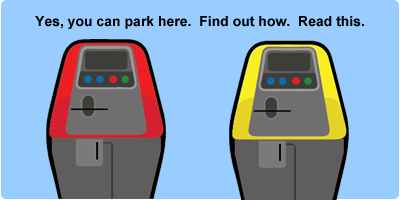 Most drivers are afraid to park at red and yellow metered parking spots because they don't understand the rules, fear getting towed, and miss the opportunity to park their car. Read this article and you'll learn the rules to park there safely. You'll park there while other drivers shy away from these parking spots. 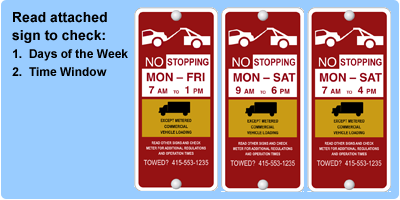 San Francisco has over 4200 red and yellow metered parking locations that are reserved for commercial vehicles during the days and hours printed in the small sign below the meters. Regular cars can park there outside those times. During the day, commercial vehicles need these parking spaces to deliver goods to businesses; convenience stores need to receive new inventory of drinks and snacks, and restaurants need to restock ingredients. Depending on the block on which a red or yellow meter is on, the days for which those street parking spots are dedicated for commercial vehicles are different. Typically, they are reserved for commercial vehicles from Monday through Friday, or from Monday through Saturday. There are exceptions. You must read the small sign attached below the meter. In addition, the hours for which these parking spots are reserved for commercial vehicles differ depending on their location. Red and yellow metered parking spots are enforced as commercial parking spots starting as early at 6am and as late as 12 noon. Enforcement can end as early as 11am and late as 6pm. The time period varies widely. You must read the small sign attached below the meter. Regular cars can park at a red or yellow meter outside those hours, as long as there are no tow away, street cleaning, or any other parking restriction rules affecting the spot. Sometimes, when the commercial vehicle hours end, the metered parking spot charges no money; it is free for you to park there although other regular gray metered parking spots may charge money. Getting a red or yellow capped metered parking spot requires a lot of sign reading. The good news is that ParkinSF.com will let you know which spots are permissible for regular cars without your having to get out of the car to read the information on the meters. ParkinSF.com knows the rules that are written on the meters and the small signs below the meters. 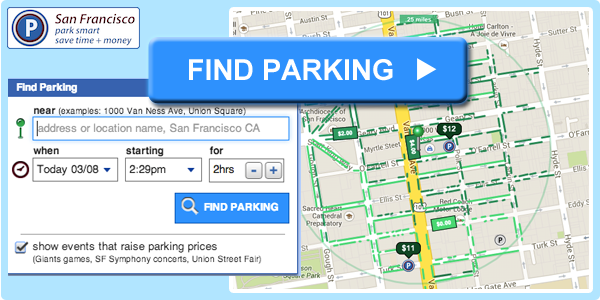 If you give ParkinSF.com the hours when need to park, it will show you the red or yellow meter parking spots that are no longer reserved for commercial vehicles - parking spots where you can park your car. In addition, ParkinSF.com calculates street cleaning and tow away times for those metered spots and won't tell you to go there if these rules restrict parking. With ParkinSF.com, you can actually drive to red or yellow capped metered spots that other drivers are afraid of, and only double check by reading the small signs after you've parked your car.